First Paragraph(s): 1. Just past three o'clock in the afternoon, when schools across London were releasing much-adored children by the bucketful, Tabitha Crum was ushered into the cold as well. She tarried at the edge of St. John's gate, threading an arm through the bars and observing the world for a moment, ignoring the jostling of boys and girls who seemed in such a hurry to return to the places they belonged. "Today," she whispered to a small lump in her satchel pocket, "we find ourselves in a curious situation, sir." Slipping an envelope from her bag, she lightly tapped it against the obtrusion. "Off we go." 2. The cobblestone streets in the village of Wiltingshire were made eerie and muted by thick November fog, and clip-clopping carriage horses snorted up and down the road, emerging and disappearing into the mist. Almost like ghosts, Tabitha mused. She clutched and rubbed the pretty envelope, letting one fingernail linger along the seam. The hand-delivery messenger had passed two letters to the teacher, glaring severely and emphasizing three times that they were not to be opened, but given to the parents of the children. What she and beastly Barnaby Trundle had done to deserve the elegant envelopes was unknown. The only certainty was that the glue was of a stubbornly good quality and Tabitha's nails were of a woefully short length. 3. "It's as though they've sealed it together with spite," Tabitha muttered to the pocket lump, earning an offended glance from a passing elderly lady. Whether it was the muttering, the remark itself, her outgrown uniform, her worn grayish schoolbag that resembled a mangy rabbit, or a combination, Tabitha couldn't be sure. Perhaps the woman was offended by children as a whole, rather like her mum and dad. After weeks of reading nothing but horror stories for adults, it was unbelievably refreshing to read such a wonderful middle grade book as Nooks and Crannies. If there's anyone who could pull me back to the world of middle grade, it's Jessica Lawson, as I so enjoyed her previous book, The Actual and Truthful Adventures of Becky Thatcher. 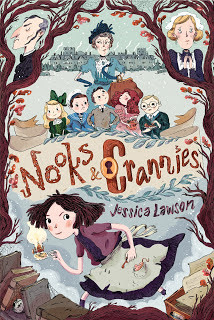 I don't know that I like Nooks and Crannies MORE than Lawson's previous book, but I certainly like it at least as much. You should read both and pick your favorite. What's interesting to me is that both books are about strong young female characters with great passion who live in past periods in which all the characters speak in dialect. And both books are very obvious about invoking the voice of famous authors. You can call Jessica Lawson a lot of things (seriously though, don't), but a coward isn't one of them. She threw herself completely into the world of Twain with never a thought of inviting unfavorable comparisons and in Nooks and Cranies she throws herself into the world of 1907 England and channels just the right amount of Roald Dahl. A second voice, that of her mother, snuck in to repeat the answer to a much younger Tabitha's question. You want us to love you, is that right? Love, Tabitha Crum, is to be earned, not given away to just anyone like a festering case of fleas. Adults, Tabitha decided, had an enormous capacity for cruelty. But then again, so did children. Cruelty, she supposed, was one of those skills that ripened with age, but could be learned and executed quite well during any of life's stages. That's a fairly dark place to start our middle grade adventure. Roald Dahl would approve:) Rest assured, there's plenty of fun ahead for Tabitha, who's to have run-ins with ghosts among other things. There's a mystery to be solved and an adventure to be had and a couple of twists and turns that caught me by surprise and are best not spoiled for new readers, so that's where we'll leave the review portion of this review. But I can't spoil anything if we take a closer look at those three opening paragraphs, so let's do that. The first time I read those paragraphs, I read the rest of the chapter--I couldn't stop myself, Lawson had successfully sucked me in. But I went back and reread them after and I've read them multiple times since as together, those three paragraphs are one of the best openings for a novel I've ever read. However, this mystery of the lump is a side game and not a suitable hook for a 336-page novel in and of itself, which is why Tabitha tells the lump about a "curious situation" they find themselves in involving a mysterious envelope. Paragraph 2 elaborates on setting and has Tabitha musing that the mist is "almost like ghosts." That's not just musing, it's foreshadowing! But as with the mystery of Tabitha's lump (a fine title for the sequel), this is a secondary concern. Paragraph 2's main function is to hit us with details about that envelope such as Tabitha's inability to open it and the messenger's insistence that it not be opened. J.J. Abrams would be well-pleased with this opening, but the hook is not fully set until the third paragraph. It's here we're told about Tabitha's impoverished appearance. A poor child is a sympathetic character and if he or she is made to sleep in the attic or a crawl space, that's even better:) In this case, Lawson goes to pains to tell us that Tabitha's parents are "offended by children as a whole." Hook, line, and sinker--Lawson has pulled the reader into her story, because we have an interesting character. A little girl who's parents don't care for her is automatically sympathetic and interesting, or at least, has the potential to be. Obviously, another 336 pages are required to fully establish Tabitha and tell her story, but this opening is like a cannon blast to propel readers through the novel and I think obsessively rereading it has made me a better writer. Esteemed Reader, you should read that opening and the book that follows and if you haven't already, check out this interview with Jessica Lawson. "There's no way she'll let you in!" yelled a horrid voice. Wafting alongside the insult were the scents of burned toast and rotting cinnamon. There only one boy at St. John's who wore such pungent odors. Sure enough, she turned to see Barnaby Trundle pedaling a slow circle in the road. "I thought we were fairly poor," Tabitha said. "And that's why I sleep in the attic." "Ignorant, that's what you are," Mr. Crum sniffed. "We're not poor. You sleep in the attic because it keeps you submissive and humble, and Mrs. Lanolin-Griffiths says humility and a submissive nature are what top bachelors look for in a wife. Once again, you're welcome." No less than ten chimneys dotted the estate like top look-outs, and three small diamond-shaped windows perched closely together near the very top of the Hall. I would deduce, Pemberley, Tabitha said silently, that even the attic space in Hollingsworth Hall is certain to be true cozy quarters. Why, oh why, was it so much easier to interact with Pemberley than with people? It was desperately confusing to both yearn for others to include you and half wish that they wouldn't. Hmm. A hesitant answer is one that always begs another question, Pensive would say. Somehow missed this! Put it on reserve at the public library. Looks good!